i /nəˈvædə/ is a state located in the western, mountain west, and southwestern regions of the United States. With an area of 110,561 square miles (286,350 km2) and a population of about 2.7 million, it is the 7th-largest and 35th-most populous state. Over two-thirds of Nevada's people live in the Las Vegas metropolitan area, which contains its three largest incorporated cities. Nevada's capital is Carson City. The quartzite of the Prospect Mountain Formation on top of Wheeler Peak, the highest peak entirely within Nevada. The second syllable of "Nevada" is correctly pronounced with the /æ/ vowel of "bad". Many people from outside the Western United States pronounce the name /nəˈvɑːdə/, with the /ɑː/ vowel of "father"; this is closer to the Spanish pronunciation of 'a', but is considered incorrect by locals. Notably, George W. Bush made this faux pas during his campaign for the 2004 US Presidential Election. Vindication later came when President Bush campaigned at the Reno-Sparks Convention Center on June 18, 2004. The president opened his talk by proclaiming that "It's great to be here in /nəˈˈvædə/," emphasizing the correct 'a' — the crowd roared its approval when he light-heartedly noted, "You didn't think I'd get it right, did ya?" Bush subsequently carried the state in the election. Assemblyman Harry Mortenson has proposed a bill to recognize the alternate (quasi-Spanish) pronunciation of Nevada. Nevada is made up of mostly desert and semiarid climate regions, daytime summer temperatures sometimes may rise as high as 125 °F (52 °C) and nighttime winter temperatures may reach as low as −50 °F (−45.6 °C). The winter season in the southern part of the state, however, tends to be of short duration and mild. Most parts of Nevada receive scarce precipitation during the year. Most rain falls on the lee side (east and northeast slopes) of the Sierra Nevada Range. The average annual rainfall per year is about 7 inches (18 cm); the wettest parts get around 40 inches (100 cm). Nevada's highest recorded temperature is 125 °F (52 °C) at Laughlin on June 29, 1994 and the lowest recorded temperature is −50 °F (−45.6 °C) at San Jacinto on January 8, 1937. Nevada's 125 °F (52 °C) reading is the third highest temperature recorded in the U.S. just behind Arizona's 128 °F (53 °C) reading and California's 134 °F (57 °C) reading. Nevada is notable for being one of only two states to significantly expand its borders after admission to the Union. Nevada achieved its current southern boundaries on May 5, 1866, when it absorbed the portion of Pah-Ute County in the Arizona Territory west of the Colorado River, essentially all of present day Nevada south of the 37th parallel. The transfer was prompted by the discovery of gold in the area, and it was thought by officials that Nevada would be better able to oversee the expected population boom. This area includes most of what is now Clark County. 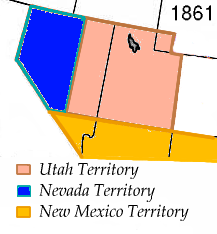 In 1868 another part of the western Utah Territory, whose population was seeking to avoid Mormon dominance, was added to Nevada in the eastern part of the state, setting the current eastern boundary. Unregulated gaming was commonplace in the early Nevada mining towns but outlawed in 1909 as part of a nation-wide anti-gaming crusade. Because of subsequent declines in mining output and the decline of the agricultural sector during the Great Depression, Nevada again legalized gaming on March 19, 1931, with approval from the legislature. At the time, the leading proponents of gaming expected that it would be a short term fix until the state's economic base widened to include less cyclical industries. However, "re-outlawing" gaming has never been seriously considered since the industry has become Nevada's primary source of revenue today. According to the 2008 census estimates racial distribution was as follows: 65% White American, 7.1% African American, 6% Asian American (estimates placed them at 10%), 2% others (American Indians and Pacific Islanders) and the remaining 20% were Hispanics or Latinos of any race. In terms of diversity, Nevada is home to many cultures and nationalities. Las Vegas and Reno or Washoe County has evolved to become Minority majority cities and counties. Nevada also has a sizable Basque ancestry population. In Douglas, Mineral and Pershing counties, a plurality of residents are of Mexican ancestry with Clark County (Las Vegas) being home to over 200,000 Mexican Americans alone; Nye County and Humboldt County have a plurality of Germans; and Washoe County has many of Irish-Americans. Americans of English descent form pluralities in Lincoln County, Churchill County, Lyon County, White Pine County and Eureka County. Las Vegas is home to rapid-growing ethnic communities like Scandinavians, Italians, Poles, Greeks, Spaniards and Armenians. Largely African-American sections of Las Vegas ("the Meadows") and Reno can be found. Many current African-American Nevadans are newly transplanted residents from California, the Midwest, or the East Coast. Since the California Gold Rush of the 1850s brought thousands of Chinese miners to Washoe county, Asian Americans lived in the state. They were followed by a few hundred of Japanese farm workers in the late 19th century. By the late 20th century, many immigrants from China, Japan, Korea, the Philippines and recently from India and Vietnam, came to the Las Vegas metropolitan area. The city now has one of America's most prolific Asian-American communities, with a mostly Chinese and Taiwanese area known as "Chinatown" west of I-15 on Spring Mountain Boulevard, and an "Asiatown" shopping mall for Asian customers located at Charleston Avenue/Paradise Boulevard. Filipino Americans form the largest Asian American group in the state, with a population of more than 113,000. They comprise 56.5% of the Asian American population in Nevada and constitute about 4.3% of the entire state's population. 6.8% of the state's population were reported as under 5, 26.3% under 18, and 13.6% were 65 or older. Females made up approximately 50.7% of the population. Las Vegas was a major destination for immigrants from South Asia and Latin America seeking employment in the gaming and hospitality industries during the 1990s and first decade of the 21st century, but farming and construction is the biggest employer of immigrant labor. Senior citizens (over age 65) and young children or teenagers (under age 18) form large sections of the Nevada population. The religious makeup of Nevadans include large communities of Mormons, Roman Catholics and Evangelicals, each are known for higher birth rates and a younger than national average age. American Jews represent a large porportion of the active adult retirement community. 4.0% Scandinavian (1.7% Norwegian, 1.5% Swedish, and 0.8% Danish). The economy of Nevada was "founded on mining and refounded on sin—beginning with prizefighting and easy divorce a century ago and later extending to gaming and prostitution". The Bureau of Economic Analysis estimates that Nevada's total state product in 2007 was $127 billion. Resort areas such as Las Vegas, Reno, Lake Tahoe, and Laughlin attract visitors from around the nation and world. In FY08 the total of 266 casinos with gaming revenue over $1m for the year, brought in revenue of $12 billion in gaming revenue, and $13 billion in non-gaming revenue. A review of gaming statistics can be found at Nevada gaming area. As of August 2010, the state's unemployment rate is the worst in the nation at 14.4%. As of January 1, 2006, there were an estimated 500,000 head of cattle and 70,000 head of sheep in Nevada. Most of these animals forage on rangeland in the summer, with supplemental feed in the winter. Calves are generally shipped to out-of-state feedlots in the fall to be fattened for market. Over 90% of Nevada's 484,000 acres (195,900 ha) of cropland is used to grow hay, mostly alfalfa, for livestock feed. The state sales tax in Nevada is variable depending upon the county. The minimum statewide tax rate is 6.85%, with five counties (Elko, Esmeralda, Eureka, Humboldt, and Mineral) charging this minimum amount. All other counties assess various option taxes, making the combined state/county sales taxes rate in one county as high as 8.1%, which is the amount charged in Clark County. Sales tax in the other major counties: Carson at 7.475%, Washoe at 7.725%. The minimum Nevada sales tax rate changed on 1 July 2009. U.S. Route 50, also known as "The Loneliest Road in America." The state is one of just a few in the country that allow semi-trailer trucks with three trailers—what might be called a "road train" in Australia. However, American versions are usually smaller, in part because they must ascend and descend some fairly steep mountain passes. The current Governor of Nevada is Brian Sandoval, a Republican; the governor of Nevada is limited by the Nevada Constitution to two four-year terms in office, by election or succession (lifetime limit). Nevada's two U.S. senators are Harry Reid (Democrat) and Dean Heller (Republican), who, by the United States Constitution, have no term limits. Reid is also the current Majority Leader in the US Senate. Nevada's U.S. Representatives are Republicans Joe Heck and Democrat Shelley Berkley. The third representative's seat is vacant. The Nevada Legislature is a bicameral body divided into an upper house Senate and a lower house Assembly. Members of the Senate serve for four years, and members of the Assembly serve for two years. Both houses of the Nevada Legislature will be impacted by term limits starting in 2010, as Senators and Assemblymen/women will be limited to a maximum of 12 years service in each house (by appointment or election which is a lifetime limit) - this provision in the constitution was recently upheld for legislators by the Supreme Court of Nevada in a unanimous decision (7-0), so term limits will be in effect starting in 2010. Each session of the Legislature meets for a constitutionally mandated 120 days in every odd-numbered year, or longer if the Governor calls a special session. Currently, the Senate is controlled by the Democratic Party (12 to 9 majority) and the Assembly is controlled by the Democratic Party (28 to 14 majority). Nevada's state sales tax rate is 6.85 percent. Counties may impose additional rates via voter approval or through approval of the Legislature; therefore, the applicable sales tax will vary by county from 6.85 percent to 8.1 percent in Clark County. Clark County, which includes Las Vegas, imposes four separate county option taxes in addition to the statewide rate - 0.25 percent for flood control, 0.50 percent for mass transit, 0.25 percent to fund the Southern Nevada Water Authority, and 0.25 percent for the addition of police officers in that county. In Washoe County (which includes Reno), the sales tax rate is 7.725 percent, due to county option rates for flood control, the ReTRAC train trench project, mass transit, and an additional county rate approved under the Local Government Tax Act of 1991. Non-alcohol drug laws are a notable exception to Nevada's otherwise libertarian principles. It is notable for having the harshest penalties for drug offenders in the country. Nevada remains the only state to still use mandatory minimum sentencing guidelines for marijuana possession. However, it is now a misdemeanor for possession of less than one ounce but only for persons age 21 and older. In 2006, voters in Nevada defeated attempts to allow possession of 1 ounce of marijuana (for personal use) without being criminally prosecuted, (55% against legalization, 45% in favor of legalization). Also, Nevada is one of the states that allows for use of marijuana for medical reasons (though this remains illegal under federal law). The state's U. S. Senators are Democrat Harry Reid, the Senate Majority Leader, and Republican Dean Heller. The Governorship is held by Brian Sandoval, a Republican from Reno. There are 68 designated wilderness areas in Nevada, protecting some 6,579,014 acres (2,662,432.5 ha) under the jurisdiction of the National Park Service, U.S. Forest Service, and Bureau of Land Management. Nevada is not well-known for its professional sports, but the state takes pride in college sports, most notably the Nevada Wolf Pack (representing the University of Nevada, Reno) of the Western Athletic Conference and the UNLV Rebels of the Mountain West Conference. In 2012, Nevada will join its cross-state rival in the MWC. UNLV is most remembered for its men's basketball program, which experienced its height of supremacy in the late 1980s and early 1990s. Coached by Jerry Tarkanian, the Runnin' Rebels became one of the most elite programs in the country. In 1990, UNLV won the Men's Division I Championship by defeating Duke 103–73, which set tournament records for most points scored by a team and largest margin of victory in the national title game. In 1991, UNLV finished the regular season undefeated. Forward Larry Johnson won several awards, including the Naismith Award. UNLV reached the Final Four yet again, but lost their national semifinal against Duke 79-77, and is referred to as one of the biggest upsets in the NCAA Tournament. The Runnin' Rebels were the Associated Press pre-season #1 back to back (1989–90, 1990–91). North Carolina is the only other team to accomplish that (2007–08, 2008–09). Area 51 is located near Groom Lake, a dry salt lake bed. The much smaller Creech Air Force Base is located in Indian Springs, Nevada; Naval Air Station Fallon in Fallon; Hawthorne Army Depot in Hawthorne; and the Tonopah Test Range near Tonopah. ^ "Table 2. Annual Estimates of the Population of Combined Statistical Areas: April 1, 2000 to July 1, 2009 (CBSA-EST2009-02)" (CSV). 2009 Population Estimates. United States Census Bureau, Population Division. 2010-03-23. http://www.census.gov/popest/metro/tables/2009/CBSA-EST2009-02.csv. Retrieved 2010-04-19. ^ "Federal Land Acres in Nevada". US Dept. of the Interior, Bureau of Land Management. Archived from the original on 2006-09-30. http://web.archive.org/web/20060930112237/http://www.nv.blm.gov/landsales/LandFedAcresAgency.pdf. Retrieved 2009-05-07. ^ "Nevada". Wordreference.com. http://www.wordreference.com/es/en/translation.asp?spen=nevada. Retrieved 2007-02-24. ^ "Myth #123 - Pronouncing Nevada". Nevadaculture.org. http://nevadaculture.org/nsla/index.php?option=com_content&task=view&id=804&Itemid=95. Retrieved 2010-07-31. ^ By Les Christie, CNNMoney.com staff writer (2006-12-25). "CNN". Money.cnn.com. http://money.cnn.com/2006/12/22/real_estate/fastest_growing_states/index.htm. Retrieved 2010-07-31. ^ "www.census.gov". http://www.census.gov/geo/www/cenpop/statecenters.txt. Retrieved 2010-07-31. ^ doug (2008-08-08). "People keep moving to Nevada...". Employerblog.recruitingnevada.com. http://employerblog.recruitingnevada.com/2008/08/08/people-keep-moving-to-nevada/. Retrieved 2010-07-31. ^ "Language Map Data Center". Mla.org. 2007-07-17. http://www.mla.org/map_data_results&state_id=32&mode=state_tops. Retrieved 2010-07-31. ^ "Pew Forum on Religion & Public Life". Religions.pewforum.org. http://religions.pewforum.org/maps. Retrieved 2010-07-31. ^ "The Association of Religion Data Archives | Maps & Reports". Thearda.com. http://www.thearda.com/mapsReports/reports/state/32_2000.asp. Retrieved 2010-07-31. ^ "BEA : Gross Domestic Product by State". Bea.gov. 2009-06-02. http://www.bea.gov/regional/gsp/. Retrieved 2010-07-31. ^ "Regional and State Employment and Unemployment Summary". Bls.gov. 2010-07-20. http://www.bls.gov/news.release/laus.nr0.htm. Retrieved 2010-07-31. ^ "Taxation Publications". Tax.state.nv.us. http://tax.state.nv.us/pubs.htm#Sales. Retrieved 2010-07-31. ^ Lawrence M. Friedman, American Law in the Twentieth Century (New Haven: Yale University Press, 2002), 596-597. ^ "The Tax Foundation - Tax Research Areas > Nevada". Tax Foundation. http://www.taxfoundation.org/research/topic/42.html. Retrieved 15 September 2010. ^ "State smoking ban sparks zone-change request for Gardnerville parcel Nevada Appeal serving Carson City, Nevada". Nevadaappeal.com. 2007-10-06. http://www.nevadaappeal.com/article/20071006/NEWS/110060112. Retrieved 2010-07-31. ^ "Have Nevada bars given up the smoking habit?". Kvbc.com. http://www.kvbc.com/Global/story.asp?S=6466938. Retrieved 2010-07-31. ^ "Las Vegas Now-Breaking News, Local News, Weather, Traffic, Streaming Video, Classifieds, Blogs - UPDATED: Bilbo's Smoking Lawsuit Case". Klas-tv.com. http://www.klas-tv.com/Global/story.asp?S=7293936. Retrieved 2010-07-31. ^ a b "Nevada Ranked Most Dangerous State". KIROTV. 2008-03-17. http://www.kirotv.com/news/15618530/detail.html. Retrieved 2009-01-04. ^ "The 15th Annual Most Dangerous State Award, Nevada Still Fighting the Problem". cqpress. 2009-01-04. http://os.cqpress.com/Crime%20State%202008_Most%20Dangerous.pdf. Retrieved 2009-01-04. ^ "Overview of Nevada's CorrectionalSystem". NICIC. 2009-01-04. http://www.nicic.org/Features/StateStats/?State=NV. Retrieved 2009-01-04. ^ "Voter Registration Statistics - 2010 Elections". Nevada Secretary of State. http://nvsos.gov/index.aspx?page=312. Retrieved 2010-07-07. ^ "Wilderness.net". Wilderness.net. http://www.wilderness.net. Retrieved 2010-07-31. This page uses content from the English language Wikipedia. The original content was at Nevada. The list of authors can be seen in the page history. As with this Familypedia wiki, the content of Wikipedia is available under the Creative Commons License.